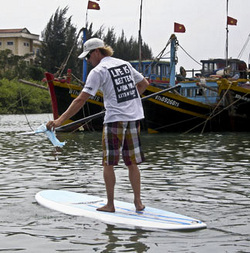 Rob Kidnie, the founder of KNS, has set himself a unique challenge: to standup paddle the length of the Mekong River from Cambodia through Vietnam, to the East Sea - and in the process, raise awareness of the problems of waterway, beach and ocean pollution in South-east Asia.
" I am a passionate life-long surfer/kitesurfer/paddleboarder that has spent the last eight years traveling the world chasing wind and waves. I have spent the majority of my time in Asia, with the last five years predominantly in Vietnam. In my travels I am often sickened by the amount of rubbish that I see in the oceans, waterways and on the beaches. I have thought long and hard about what I could do to help this situation." Follow Robs progress using this site and tune in to his daily blog which will document the ups and downs of the challenge. Rob will be stopping along the way to give presentations to different universities on the problem Vietnam and S.E. Asia has with plastic pollution and the small measures that local people can take to help the oceans and waterways return to their natural beauty. The paddle will commence from the Cambodian border near Chau Doc on the 14th of May 2011 and Rob plans to clock up around 20-30kms a day which will see him finishing in the East Sea around 24th May. hosting a wide range of projects, all aiming for Emancipation and Autonomy. View more presentations from Robert Kidnie.